Italy, 1961, 110 minutes, Black and white. Accatone is worth seeing as an early example of Pasolini's work. He is a novelist and poet as well as a film-maker. After collaborating with Fellini and Bolognini on scripts, he began directing his own with this film in the early 60's. Some of his noted films are 'La Ricotta' (a memorable short episode in Rogopag, satirising the making of Biblical spectaculars), Mama Roma, The Gospel According to Matthew, Teorema. He has also made a version of 'Oedipus' with Franco Citti of Accatone and Medea' with Maria Callas. 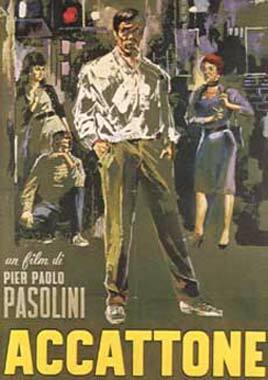 Accatone films ordinary people in the Roman streets and slums as De Sica did for his great films of neo-realism. Most of the film is episodic, showing Vittorio, a lazy and insolent young man, nicknamed Accatone, exploiting friends end prostitutes until his values receive a jolt as he tries to make a prostitute of a simple girl, Stella. In the closing part of the film, Pasolini has a dream sequence which changes the mood of the film somewhat abruptly and possibly prepares us for the melodramatic symbolic ending of Accattone's death. Photography and character acting is excellent and there is a score of Bach music which has a contrasting effect, giving a classical and solemn background to brawls and distancing the audience from the action. 1. Was this an interesting picture of a part of Roman life in the 60s? 2. How did the location photography and the authentic casting of the actors contribute to the realism of the film? Did you think the film was authentic? 3. What was the effect of the use of the Bach score? How incongruous? How did it contrast with the visual images? Did it tend to dignify the characters in the film? Did the classical tones distance the audience and make it concentrate on meaning? 4. What kind of person was Accatone himself? Did he have any likeable traits? What did his facial expressions, his style of walking, his behaviour indicate about him? 5. How do you explain Accatone and his friends? What social values made them as they were? How much was their own choosing? How irresponsible were they? How lazy? 6. What relationship did Accattone have with Maddalena? Why was he glad to be rid of her in gaol? 7. What picture of a prostitute's life did the film give -Maddalena, Amore? 8. Were you surprised that Accattone had a wife and child? Did he deserve the beating end scorn of his brother-in-law? 9. Did Accatone have any moral standards, any conscience as regards Maddalena, Ciccio's wife and children, his companions (the spaghetti sequence), his own family and, especially, his child? 10. How simple and naive was Stella? Was she likeable? How did you feel when you saw Accatone begin to turn her into a prostitute? Why? 11. How did Stella affect Accatone and his conscience? Why was she frightened of, yet resigned to, being a prostitute? 12. Why did Accatone work for a day? How did it affect him? Did he do it for Stella? Did he love her? 13. What was the effect of showing the audience the eyes of the detective trailing Accatone? Did it affect the realism? 14. Why did Accatone dream as he did? What was the significance of the dream, his life and death? How did this change him and his conscience? 15. Was the dream sequence out of place in this film? How (did it change the mood of the film? 16. Why did Accatone collaborate in thieving? melodramatic, solving the plot too easily? it meant to be symbolic, that society formed Accatone (Vittorio)? In life and death, he could not escape; he could understand himself better and, therefore, death was best for him?